If you are an allergy sufferer, you know how miserable life can get when your allergies kick into high gear. A runny nose, itchy eyes, and sneezing are just the beginning. More severe symptoms can leave you with cold-like symptoms including fever, cough, and sinus infections. For anyone with breathing difficulties like asthma, allergies can be more than an illness or an inconvenience; they could actually become life threatening. That’s why so many allergy sufferers are willing to go the extra mile to make their home a sanctuary from allergens and provide them with some relief. We spend most of our lives indoors now, so protecting ourselves from allergens inside of our home is vital to our health and well-being. Spray foam insulation is something that can provide a lot of relief to allergy sufferers. One of the key factors in eliminating allergens in your home is to keep them from getting inside in the first place. That means your home needs to be very well sealed, protecting it from outdoor allergens. Most homes have plenty of spaces that allergens can sneak in, whether it’s tiny cracks alongside your windows and doors or through air leaks in your attic. Spray foam insulation works to seal all of those tiny spaces, making it much more difficult for allergen-filled air to find its way inside. That can help keep out allergens such as pollen and dust. It can even help keep out carbon monoxide (an especially beneficial feature if you live near a busy street where there are a lot of idling cars). Other types of insulation aren’t just less effective than spray foam insulation, it could actually make an allergy sufferer’s symptoms worse. That’s because many people are actually allergic to the materials used in these other kinds of insulation. The particles of the insulation can break off and make their way into the air of your home, creating more irritation for your allergies. Many homeowners find that when they replace the insulation in their homes with spray foam insulation, their allergy symptoms abate and they are able to breathe easier. Spray foam insulation doesn’t just block out allergens that come in on the air, either. It also keeps moisture from making it’s way into your home and creating mold and mildew, two things that can be especially troubling for allergy sufferers. Additionally, spray foam insulation can act as a powerful barrier against pests, meaning that your home can be more bug-free than ever, but it can help protect you from allergens carried in by pests. Ready to Protect Your Home From Allergens? 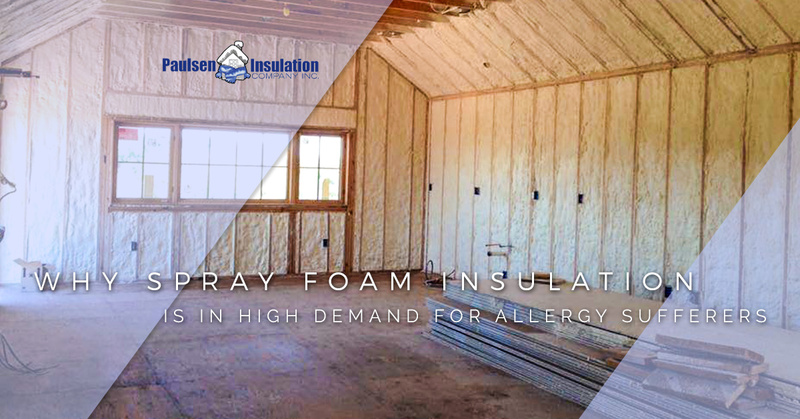 If you are tired of suffering from allergy symptoms and want to make your home a place where you and your family can breathe easy, it’s time to look at your spray foam insulation options. Get in touch with our team and let’s talk about how we can help. You can reach us by giving us a call or contacting us through our website and we’ll get in touch with you as soon as possible. We’re looking forward to helping you keep allergens out!